Bellini, in his characteristic manner, somewhat smoothes the drama of the event. For example, he makes a high biblical mountain a small hill, and Peter, James and John depicts not fallen prostrate, but just sitting on the ground. The greatness of what is happening must be understood by the viewer when he sees the radiance emanating from the figure of Christ in snow-white clothes. This radiance symbolizes the divine nature of the Savior. In the Catholic world, the feast of the Transfiguration of the Lord was always celebrated on August 6, but the landscape of Belleville looks more like an autumn one. It is possible that the paint, which used to be green, had become pale in course of time, and the picture acquired a yellowish brown tinge. 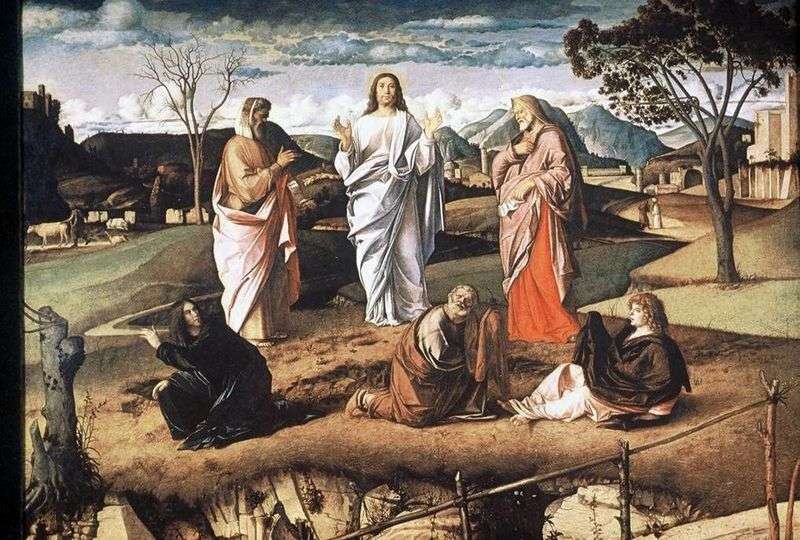 Description and meaning of the painting Transformation by Giovanni Bellini.